We are the birds of fire, we fly over the sky. We make a road for the spirits, for the spirits to pass over. Among us are three hunters who chase a bear. There never was a time when they were not hunting. We look down on the mountains. This is the song of the stars. The earth, moon and major planets orbit the sun in a common plane, the ecliptic. The earth's axis of rotation is tilted 23 degrees to this plane, as it revolves around the sun. So the earth tilts at different angles to the sun, as it revolves in orbit, shown here for the 4 seasons. When the earth's north polar axis is tilted most toward the sun, it's summer in the northern hemisphere, tilted furthest away, winter. Of course this tilt affects the sun's path across the sky -- furthest north in summer, south in winter, and the fixed stars in the night sky rise at different times and places, too. Whether they know this cause or not, all peoples who observe the skies know this relationship shown for the sun's path across the sky at 4 key days during the year -- days sacred to most indigenous peoples. Landmarks can be used if a people are always in the same place to mark the sunrise and sunset points of these four days. On a compass rose -- which looks very much like the traditional star quilt pattern -- the line between the northeast and northwest tips marks the summer solstice, when the sun is farthest north, and the line between southeast and southwest tips the winter solstice sunpath. The line across the middle -- from east to west -- is the line of both equinoxes. The Lakota were nomadic and didn't always camp at the same spots. The angle of direction and length of the sun's noon shadow can be determined, and provides a simple way to identify these 4 key days that mark the earth's seasons. There are painted hides usually identified in museums as "war bonnet" or "feather circles". These resemble elaborate compass roses used by mariners, and would be handy and portable for making solar shadow time measurements, if a stick with a plumb-bob (an arrowhead, say) were placed upright in the center of the pattern. So early evening rising just south of the ecliptic (sunpath horizon point) of first magnitude Antares (I don't know its Lakota name) indicates the sun has entered the Dried Willow constellation. Some time ago, this happened around March 20-21, the spring equinox, and was the signal for the Pipe Ceremony at winter camps that heralded a ceremonial round in the Black Hills, ending with a Solstice Sun Dance at Devil's Tower, (Grey Buffalo Horn) when the sun entered the Bear's Tipi constellation (part of Gemini) that represents it. You can compare with the Lakota starmap, then return to here with your BACK button. N ow, though, everything in the skies happens about a month later than when these ancient observational calendars -- Egyptian, Mesopotamian, Chinese, as well as Lakota -- were drawn up. This happens because the earth's north-south axis revolves around the center of the earth, so the poles slowly sweep out 2 cones in the sky, joined at their tips in the earth's center. This cycle is called the precession of the equinoxes or precessional cycle. (Its cause is a gyroscopic effect of the moon's gravitational attraction to the earth's tidal bulge.) It takes about 26,000 years for one complete revolution to sweep out the double cone. During this time, the pole star changes, to whatever stars lie on the circle swept by the north-pointing end of the earth's axis. The Pole Star -- Wichahpi Owanjila, star that always stands in one place -- was Thuban (Alpha Draconis) in 3000 B.C. Around 7500 AD, Alpha Ceiphei will be the pole star, then Deneb, then bright Vega (14000 AD), then it'll swing around to Thuban again. For many centuries there has been and will be no bright star close enogh to where the pole is to serve as pole star; the bright northern stars and constellations then seem to revolve through the night about an empty center. Now, the constellations are all displaced by about a month, a little more than 30 degrees, as regards when the sun enteres them (i.e. where/when they rise). The sun is in Dried Willow (or Aries) now around April 23, instead of March 21; it gets to the Pleiades (Animal's head) about a month late, and it's about a month late entering Mato Tipila, for the Sun Dance at Devil's Tower. From this, we can date the most probable origin of this knowledge and these ceremonies. It takes 26,000 years for the poles to precess the big double-cone 360 degrees for the great Polar Sky Circle, so it takes about 72 years to precess one degree. Since the poles have precessed about 30 degrees, (30 x 72 = 2160) years ago the stars were in the right places at the right times to guide the ceremonies as Lakota elders still recall. Many Sun Dances have tended to be held quite late in the summer in recent years. Where these are guided by knowledgeable elders who make star observations, it seems likely those elders follow the stars, even though that puts them a month or more behind the sun. It's the same dilemma astrologers face. None of the constellations that represent animals of the monthly zodiac corresponds any longer to the birth month you see in those little horoscopes in many newspapers. The original observations are too old; the earth's poles have revolved too far. It will be more than 20,000 years before they come back around again, and the traditional constellations are once again in synch with key solar dates that determine the earth's seasonal round. Be aware that the dates for solstices and equinoxes are approximate. For example, in 1996, the vernal equinox is March 20, summer solstice is June 20, fall equinox is September 22, and winter solstice is December 21. So the dates on my diagrams are a "within 2 days" approximation. Details of the sun's path through the starry skies over a solar year, and a large chart of the major constellations, ends with a comparison of how the sun's current apparent path relates to the cosntellationsd at the time these astronomical observations were made, 2,000 years ago (still used for horoscope chartings in the discredited science of astrology). Check it out; return here with BACK or a menu icon at the end of that page. CREDITS:The poem is an Abenaki-Passamaquoddy song collected in Maine by Charles G. Leland around 1882; he gives a phonetic version of it in the language-dialect of that time, "Glint-wah-gnour, Pes Sausmok,"This is the Song of the Stars, in Algonquian Legends, Dover reprint (1992) of Leland's 1884 book pubished by Houghton Mifflin. 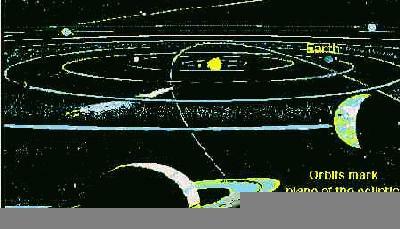 Some solar system drawings were adapted from a DOS hypertext teaching program, ORBITS, by WinterTech, 1992. Others were drawn by me (first in FreeHand) from data in several astronomy and Earth Science textbooks.